Caught on camera during his set at DC’s Echostage this weekend, NGHTMRE decided to roll the dice and end his set with the brand new remix. Sticking to his winning formula for filthy trap reworks, the Mad Decent star intertwines the Skrillex and ZHU’s blaring horn lead with clashing percussion and seismic 808s to pack the original production with a new punch. 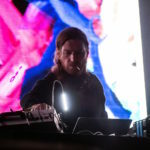 Unfortunately, there is no official release date for the remix but the crowd video above will give fans a sense of what is to come when NGHTMRE unleashes it.